I always hesitate to use the word "bust" because readers often associate that word with players who will have absolutely horrible seasons. I prefer to use the word "overvalued" instead. As a drafter, this is what I am always looking for: value. If a player is going two rounds higher than I projected him at, I'm not going to draft him, no matter if I think he's going to have a good season or not. 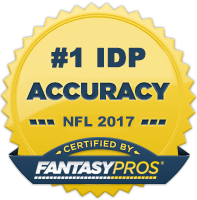 In this article, I recommend three players at each of the 3 defensive positions (DL, LB, DB) who I believe will be significantly overvalued heading into the 2012 fantasy season. This list will be continually updated throughout the off-season. RDE Julius Peppers (CHI) - Peppers is one of the elite pass rushers in the NFL and has made his impact clearly felt since signing with the Bears. He reached double digit sacks for the 6th time in his career despite struggling through some injuries throughout the course of the season. He does have a couple of potential issues that slightly concern me, however. First, his tackle numbers were the lowest since his rookie season. Secondly, the Bears have no serious pass rushing threat opposite Peppers which means he gets constantly double teamed. Add in the age factor (32) and there's some cause for concern (especially in dynasty leagues). However, his high marks for consistency keep him at the bottom edge of the elite tier for this season. RDE John Abraham (ATL) - Abraham has been an IDP staple for a long time, but he's not an every down player anymore. The Falcons will look to limit his snaps and turn him into more of a situational pass rusher. He can still put up double digit sacks, but he's just not going to produce much in the tackle column. DL3 in balanced leagues, DL2 in sack-heavy leagues. RDE Kyle Vanden Bosch (DET) - From a pass rushing consistency point of view, KVB played quite well last season. However, his tackle numbers have been steadily decreasing since the peak of his career and he can no longer be counted on for monster fantasy weeks. He's a good stop gap play, but nothing more at this point in his career. MLB Curtis Lofton (NO) – Lofton was a top 10 linebacker in Atlanta over the last three seasons. His move to the Big Easy ultimately will diminish his fantasy value especially with the signing of David Hawthorne. I still expect him to be a three-down backer, however his opportunity will likely decrease as he won't see as many overall snaps playing on a time-consuming offensive team such as the Saints. SLB James Anderson (CAR) – For those who place a lot of emphasis on previous years' stats, Anderson's being on this list may surprise them. He put up LB1-type numbers with 98 solo tackles, 48 assists, and 1.5 sacks and put up similar numbers the year before. However, in both of these seasons Anderson received a significant bump in playing time due to injuries to fellow linebackers (Thomas Davis in 2010 and Jon Beason/Thomas Davis is 2011). Assuming both Beason and Davis come back healthy, Anderson may once again be relegated to a two-down role on the often times fantasy stingy strong side. Beware of drafting Anderson too early. WLB David Hawthorne (NO) – Hawthorne was a favorite of mine heading into the 2011 season. Although he performed less stellar then expected, many of his struggles early on can be attributed to a knee injury which significantly limited his range and kept off the field on passing plays. His signing with the Saints means that he will most likely be playing on the weakside next to Curtis Lofton. With this said, expect a decline in fantasy production for Hawthorne. Draft him as an LB3. LCB Lardarious Webb (BAL) - Webb came out of nowhere last season and established himself as one of the top up-and-coming shutdown corners in the game. Now that the news is out on Webb expect less teams to throw his way. In the end, this will most likely hurt his overall fantasy production. So I wouldn't expect another top 20 finish again, but he's definitely got a nose for the ball (a lot Charles Woodson) and is worth the risk as a DB3+. LCB Kyle Arrington (NE) - Arrington is another one of those undrafted cornerbacks who has become a fantasy force recently. His 7 INTs last season were tied for the league lead and he also produced above average tackle numbers. Keep in mind however that Arrington has only had one good year and that the CB position has so much year-to-year volatility that I don't feel comfortable using a high pick on him. FS Ed Reed (BAL) - Reed continues to be drafted as a top 30 defensive back despite failing to live up to that draft position over the last couple of seasons. He’ll turn 34 this September and has become increasingly injury-prone in his old age. His big play ability makes him viable as a DB4+ in scoring formats that reward big points for those types of plays, but he’s best left on the waiver wire in all but the deepest of balanced and tackle-heavy leagues.